Tompkins has approval for two 5,000 square foot commercial buildings at the corner of Monterey and Santa Rosa streets, the location of a former Shell service station. Tompkins is now proposing a 75-foot high development that would include the hotel, residential units, offices, retail space and a public plaza. The new plan is scheduled to go before the architectural review commission on Dec. 7. Zoning issues will likely arise. Tompkins’ property is currently zoned retail-commercial which allows buildings up to 45 feet tall. The planning commission can override the rule and allow for the construction of the 75-foot building if the project meets city policy objectives, like providing affordable housing, preserving history or saving energy. Tompkins is partnering on the hotel project with Andrew Firestone and Jess Parker of Santa Barbara-based StonePark Capital. 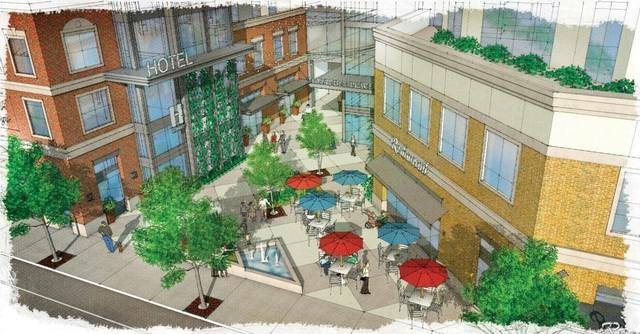 Firestone described the plan as an urban-style boutique hotel, with outside amenities and access to downtown shopping. Rachel Cohen, a city planner, said the location is a downtown gateway coming off Highway 1. Tompkins is also proposing building a 600-space public parking garage and a new transit center on adjacent properties on Higuera Street. The transit center would replace the government center bus stop at Osos and Palm streets. Tompkins is also attempting to forgo approval of a grocery store in Arroyo Grande, for approval of a 51-room hotel on East Branch Street. Tired of greedy, blood sucking developers. Tompkins is one of the biggest. He lost his slam dunk status in Arroyo Grande when Ferrara was pushed out. Seems it’s time for him to focus on SLO now. Don’t buy that ‘he’s such a nice guy’ line, he OWNS SLO just like he does AG and many other places. The City of SLO has planned for years the property where the Spring Toyoto used to be on upper Higuera (behind Shell Station). I think the City or County owns this property. So, is the City going to give away more taxpayer paid property like they did giving Copelands prime downtown property. Corruption has totally taken over our County when the Democrats took control. There is no looking back! I meant to say that the City has planned for years to make that the transportation hub for the downtown area. This is not a gift that he is giving to the City as I am sure the City/County will donate the land! Build it! Like most of the Californian’s I’ve met, they have no idea how busted this place is, nor how bad rural America has gotten. SLO is lucky it can develop projects like this. There will always be the middle or Nebraska for the people who want bunkers and live off the grid. Never been to Fresno, no desire to go. I can say SLO is the most backward, poor, going nowhere place I’ve ever lived. It’s very pretty, and that’s all folks. A place to escape from for sure. So why you here, I’m sure there are plenty of other places that would welcome you and yours. Yes, I am a native to SLO and we existed since the beginning without the likes of you. SLO use to be a pretty quaint community. Slowing it has become another shopping mesa with all the big businesses. Everyone that has been here for 50 years remember the local restaurants, bookstores, Mom and Pop stores. Now, we have the same crap as every other city in the Chinafornia tanks to money grreedy developers and this includes the Copeland and Madonna families. I’ll grant you that.. Sometimes, you stay in area because of other interests. I understand the sentiment. I can see how poor this area has been, and once growth comes in, the trailers and such get pushed out. You’ll be uprooted. But, LA couldn’t stop this process. Denver couldn’t. San Diego couldn’t. Dallas couldn’t. Nashville can’t. Once the forces begin, there isn’t a way to stop them. SLO is half in, half out. As more people get here, you’ll be all in no matter what the poor and local people think. I’m not saying it’s right, it’s just what “is”.. Sorry, but you sound like the Borg from Star Trek “You will be assimilated ……Resistance is futile”. It makes about as much sense to listen to that crap. I, for one, do not roll over and play dead for people who march in to change things that were better off the way they were, just so they can make themselves a pile of money and leave. Screw that. If you dislike this place so much, why in hell are you here? Some of us prefer nature, beautiful views and clean air to boxes piled high and full of crap from China with traffic crawling around them, spewing toxins. As you have pointed out, most other places have already been “improved” to suit you. If we are not sophisticated enough for your elevated tastes, just leave. Rules don’t matter when you have the decision makers bought and paid for. Now thats kinda a dumb place, you’ve got the gothic govt center on one side,the govt parking structure on the other side a slab sided bank on the third side and nothing better on the back side,not a spot for a hotel and not at 75 feet tall either,keep it up and we’ll be wearing jackets in the middle of summer because of all the shade in town. “Gothic” government center? Ya goth me there. And the “former Shell service station” is still selling gas though plans for the site, including a transit center, have been in the works for decades. Because the math is suddenly right to turn SLO into Santa Barbara it is surprising to many to see so rapid a downtown transformation. Wake up and smell the $5 coffee. The zoning code allows up to 75′ if certain conditions are met. Mr. Tompkins is trying to build a 75′ tall building where it is zoned for 45′ tall building, can he do ANYTHING within the general plans of ANY town? Where does this person get off thinking he is so special along with his ideas? Wonder who he is paying off in SLO?In Arroyo Grande we know he has Teresa McClish on his payroll and 3 council members Harmon, Barniech and Guthrie who thinks the moons rises and sets with this man.